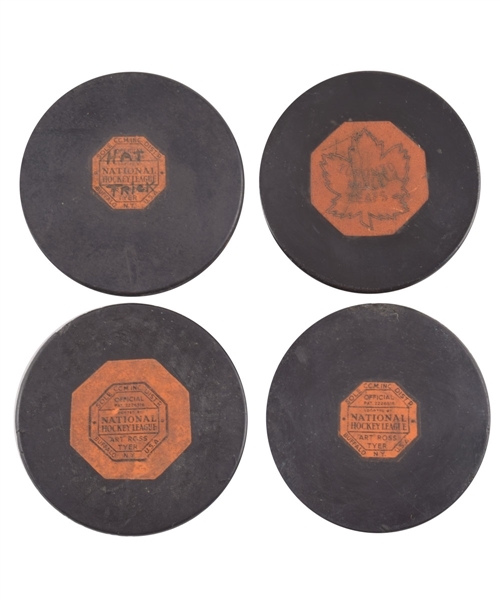 Highly coveted by collectors for both their historical importance along with their intrinsic display value, we have a collection of four vintage NHL game pucks, with the offered specimen’s all the more desirable as they have the added provenance of originating from the collection of NHL legend Tod Sloan. We have a pair of 1942-50 Art Ross game pucks including an example marked “Hat Trick” that’s attributed to Sloan’s only NHL 3-goal game (Feb 11th 1951 vs Chicago), a 1950-58 Art Ross NHL game puck and a 1962-64 Art Ross Toronto Maple Leafs game puck. An LOA from the Sloan family will accompany. Each puck’s logos are complete and show wear, with the rubberized Leafs crest faded with crazing. There are also the remnants of a label over the reverse of the “Hat Trick” puck, with gouges and small areas of loss to both the 1942-50 and 1950-58 game pucks. 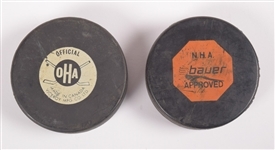 As an added bonus, a pair of post-career pucks from the Sloan collection will be included, with an OHA Newmarket Flyers example made by Viceroy along with a Bauer “NHA approved” puck, with both showing light wear.